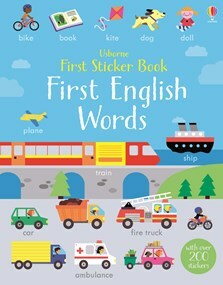 A colourful sticker book of everyday English words to help little children build their vocabulary. Little children will have fun learning new words as they spot and name familiar objects and look for the matching word stickers. With over 200 matching word and picture stickers of animals, vehicles, people, places and more to add to each page. Perfect for helping preschoolers learn new words before starting school, or for children who are learning English as a second language.